As part of the Freedom to Write Campaign, Irish PEN and WORD were in full support of this initiative and gathered the signatories below. 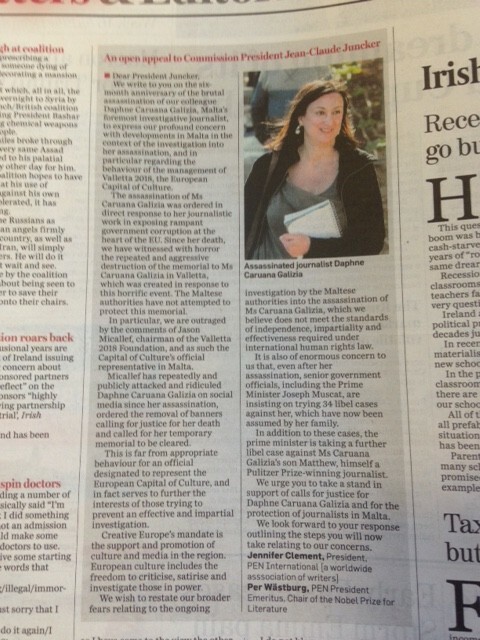 The letter appeared in The Irish Independent on 16th April. 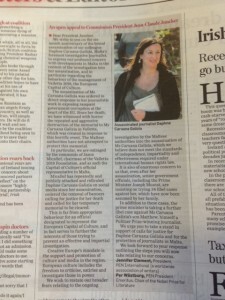 This entry was posted in Freedom to Write, Press Releases and tagged Daphne Caruana Galizia on 16 April, 2018 by Vanessa O'loughlin. Irish PEN implores the Saudi Arabian authorities and all international bodies with influence in Saudi Arabia to act immediately to prevent the whipping of blogger Raif Badawi, scheduled to take place again on Friday January 16th at Alislahia Jail, Jeddah. The imminent and potentially lethal flogging violates the absolute prohibition in international law against torture and maltreatment. In November 2014, Badawi was sentenced to 10 years in prison and 1,000 lashes for “insulting Islam” and “founding a liberal website.” According to sources close to the case, he will receive 50 lashes each Friday following morning prayers for 20 weeks; this unimaginably cruel and harsh punishment began on January 9th. The extended punishment is likely to push Badawi’s body to its outermost limits, causing severe long-term damage and possibly death. Irish PEN calls on the Saudi Arabian authorities to release Raif Badawi and his lawyer Walid Abu al-Khair immediately and unconditionally as they are being held solely for their peaceful exercise of their rights to freedom of expression. In the meantime, we call for both men to be granted all necessary medical treatment, as well as access to their families and lawyers of their choice. Irish PEN urges the Irish Government to make respect for human rights and international law a requisite for the kind of close relationship it shares with Saudi Arabia and its leader, King Abdullah ibn Abdulaziz bin Saud. We call on our Representatives to publicly condemn this action, and call for the flogging to be halted immediately and for this profoundly unjust sentence to be rescinded, allowing Badawi to return to his family. Just days ago, Enda Kenny stood shoulder to shoulder with other leaders in Paris to champion freedom of expression. Among world representatives at the pro-democracy march was the Saudi ambassador to France, Muhammed Ismail Al-Sheikh. Two days earlier, Saudia Arabia had flogged a blogger. Fifty blows in public. The first salvo in a barbaric sentence which condemns him to 1,000 lashes. His crime? Expressing ideas through free speech. He set up a website – now closed down – encouraging social debate about religious and political issues. Even as the Saudi government condemned Islamic fundamentalist violence elsewhere, it was silencing a voice of peaceful dissent at home. And in the most inhumane fashion. Tomorrow, blogger Raif Badawi is due to receive another 50 blows with a cane outside a mosque in Jeddah. The 31-year-old father-of-three will undergo this ritualised exercise in pain and humiliation for 20 consecutive Fridays. Corporal punishment is defined as torture according to international human rights law. Yet his only crime is to stimulate social debate. 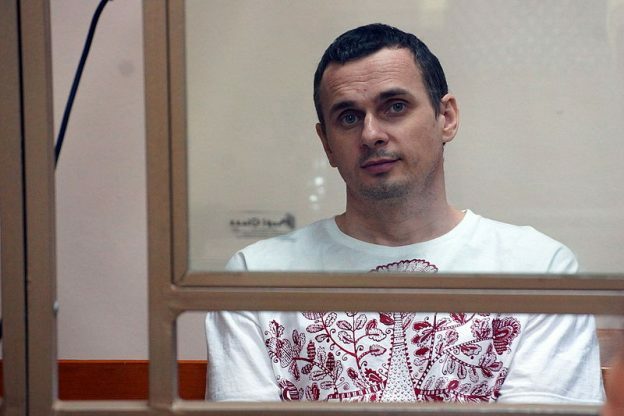 After each flogging he is returned to prison, where he has been held since June 2012. His sentence also includes a 10-year jail term and a fine of €225,000. For good measure, his lawyer was given a lengthy jail term. Irish PEN was formed in 1935. It is an association of Irish writers, associate members and friends concerned in the written word, in freedom of expression and in the love of literature. Irish PEN is affiliated to PEN International, who also condemn this action outright. This entry was posted in Press Releases on 16 January, 2015 by Vanessa O'loughlin. PEN International and 42 PEN Centres around the world condemn the unprecedented attack on the office of the French publication Charlie Hebdo in Paris today in which 12 people died and seven were injured. This is not the first time that journalists, editors, writers, cartoonists and translators have been targeted for expressing opinions that may offend, outrage or shock sections of society. But there has never been an assault on such a scale in Europe. There can be no justification for using violence to silence or intimidate those who speak out, no matter how offensive their views. In the face of such violence, it is incumbent on all governments and religious leaders to strengthen their commitment to press freedom and to safeguard freedom of expression as a fundamental human right. This attack must be investigated promptly and impartially in accordance with international standards and the perpetrators brought to justice. Journalists and writers from Brazil, Austria, Germany, Argentina, Turkey, India, Bulgaria, Iran, Norway, Pakistan, Ireland, China, Estonia, Mexico and Vietnam, among others, participate in “Time to say No!”, An anthology by Helmuth Niederle and Philo Ikonya, writers and editors. Philo Ikonya and Helmuth Niederle have produced a book of over two hundred multilingual poems and protests themed in our ability as writers to refuse violence against girls like Malala who have sought with passion to be educated. The book will be launched on the 7th and 8th of March 2013 to coincide with international Women’s Day 2013. Our sincere thanks to the Irish writers who participated and to Philo and Helmuth who have made the text available in pdf via a public drop-box link. This link will lead readers to the words of contributors aged 11-80 who desire to support the education of girls and to protest the shooting of a child. 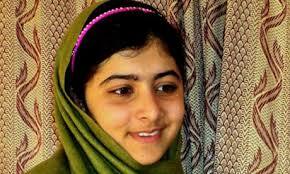 This entry was posted in Members' News, Members' Publications, Newsletters, Photos, Press Releases and tagged Education, International Women's Day 2013, Malala Yousafzai on 7 March, 2013 by Christine Murray.